In the spirit of gifting those who have touched my heart in kind, I pass this award on to those bloggers I list below. 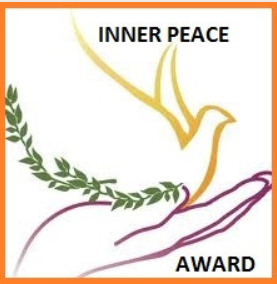 If they choose to accept, they have only to say something kind to any persons they in turn “pay forward” with the Inner Peace Award. At the same time (I am indeed blessed), I offer blessings and gratitude to http://jeaninjackson.com for the gift of the Sunshine Award. Her Life Images at Pearl St. Gallery bring me a bit of sunshine whenever I look at them, and transport my soul to so many places where I have not yet had the good fortune to travel. Her pictures tell stories like I (hopefully) express in words. 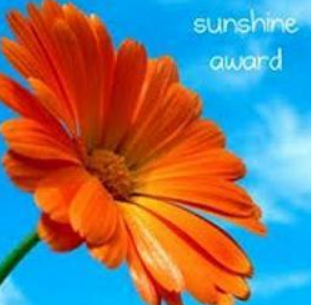 In the same spirit, I would like to nominate the same five bloggers listed above for the Sunshine Award, for the sunshine that they bring to me, and so very many others, with each post that we are all lucky enough to read. They are a gift. * I prefer to stay in B&Bs rather than hotels. * I talk to animals. * My dream: to live in a (gray) stone cottage set amidst the hills and valleys of Wales or Ireland, near some sort of water (ocean, lake, stream). * Most peaceful vacation moment: flying in a hot air balloon over the Serengeti in Tanzania. * Most profound vacation moment: crying at my first look at the citadel of Machu Picchu, Peru. * Most relaxing vacation moment: on the empty deck of the sailing ship Royal Clipper, late at night, with the sound of the waves and moonlight for company. * I prefer an aisle seat on a plane. * I prefer to hold an actual book in my hands when reading, but I did break down and buy a Kindle for when I travel to cut down on weight in my luggage. * Best place to watch fireworks: summer weekends at Oregon Ridge Park in Cockeysville, Maryland, with the Baltimore Symphony Orchestra playing in concert with the fireworks display. Congratulations on your award. Enjoy the honor. Congratulations! The honor is well deserved.